Roy Halladay pitched a perfect game on May 29, 2010 against the Florida Marlins. One of the most dominant pitchers of the past decade has announced his retirement today. Roy Halladay, who pitched 16 seasons in Major League Baseball with the Toronto Blue Jays and Philadelphia Phillies, will sign a one day contract with Toronto and end his career. Halladay is 36 years old, and struggled with injuries over the past two seasons with the Phillies. Halladay was selected with the 17th pick in the 1995 MLB Amateur Draft by the Toronto Blue Jays, and became a mainstay in the Blue Jays’ rotation for more than a decade. He became a full-time starter in 1999, and grew into an ace by the early 2000s. In 2002, “Doc” went 19-7 with a 2.93 ERA and was named to his first All-Star Game. 2003, however, was even better for Halladay. He earned 22 wins, struck out 204 batters, and earned the 2003 American League Cy Young Award. But despite being surrounded by decent pitchers and batters, Halladay never made the playoffs with the Blue Jays. In December 2009, Halladay was traded to the Philadelphia Phillies for a number of prospect players, and quickly made an impact in Philadelphia. In a career season, Halladay went 21-10 with a 2.44 ERA and a career-high 219 strikeouts. He was named to his seventh All-Star Game and helped the Phillies win their fourth consecutive NL East division title. On May 29th, he pitched the 2nd perfect game in Phillies history against the Florida Marlins, and on October 6, made his dramatic postseason debut by pitching a no-hitter against the Cincinnati Reds in the NLDS. Halladay was known for his tricky pitches, including 90+ MPH fastballs and cutters that fooled batters. 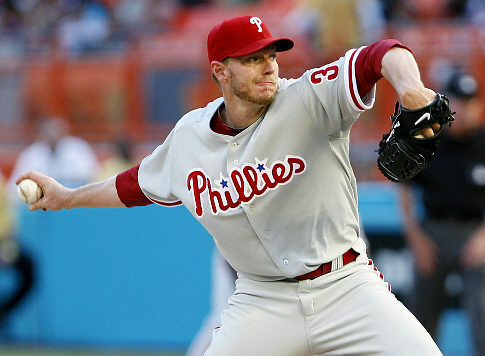 Halladay worked efficiently on the mound, and followed the same strict mechanical movement throughout his career. He also displayed immense focus during games, often refusing to talk to anyone but his catcher during his starts. In 2012, at the age of 34, Halladay began to regress, and was placed on the disabled list in May with a shoulder strain. 2013 proved to be more of the same for the Phillies ace. Halladay missed more than three months after having surgery to remove a bone spur in his shoulder. It seems that Halladay’s decision to retire is a wise move made to prevent any more injuries. Overall, Halladay finished his 16 year career with a 203-105 record, a 3.38 ERA, 68 complete games (all-time record), and 2,117 strikeouts. He made 8 All-Star appearances (and started two games), won 2 Cy Young Awards, threw a perfect game, and pitched the second no-hitter in postseason history. The world of baseball is losing a great player and a great man in Roy Halladay, but he surely left a great legacy for many pitchers to aspire to.